Released: vCloud Director 9.1.0.1 - API Tweaks and Resolved Issues - VIRTUALIZATION IS LIFE! There was a point release of vCloud Director 9.1 (9.1.0.1 Build 8825802) released last week, bringing with it an updated Java Runtime plus new API functions that allow additional configuration of advanced settings for virtual machines. There was also a number of bug fixes from the initial 9.1 release earlier in the year. Some of the issues that are resolved are significant and worth looking into if you have 9.1 GA deployed. I haven’t been able to find an exact list of the new API functions, however traversing the Org Admin rights API call I did spot something new relating to Latency as show below. And when I granted this right through the API mechanism I was able to allocate the right to the Org Admin via the administrator web interface. I’m trying get a list of all the new API rights that where added as part of this release and will update this post when I have them. In vCloud Director Tenant Portal, the Configure Services tab is disabled for Advanced Edge Gateway. In vCloud Director Tenant Portal, you cannot configure Advanced Edge Gateway settings as an administrator with any of the Gateway Advanced Services rights. 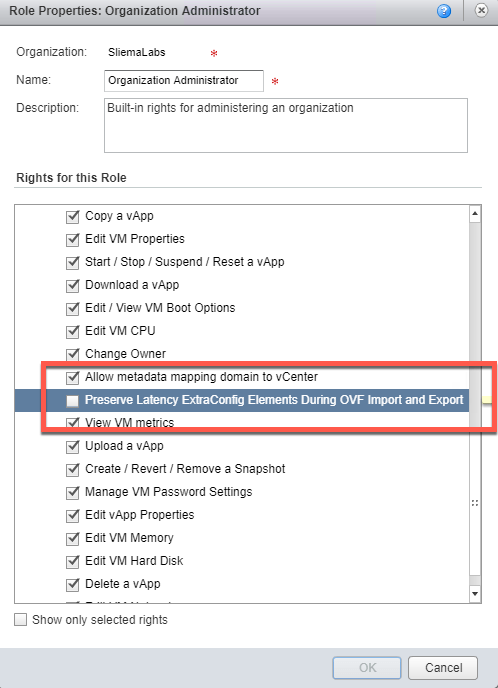 When importing a virtual machine from vCenter Server, vCloud Director relocates it to the primary resource pool. When you import a virtual machine created on a non-primary cluster in vCenter Server to vCloud Director, the machine is always relocated to the primary cluster. In the vCloud Director Tenant Portal, the administrator of one organization can see virtual machines that belong to other vCloud Director organizations. When you configure the organizations in vCloud Director to use an LDAP server for authentication, an administrator of one organization, who is logged in vCloud Director Tenant Portal, can see virtual machines that belong to other organizations. Importing a virtual machine from the vCenter Server deletes the original virtual machine after cloning it. When importing a virtual machine from the vCenter Server to vCloud Director involves changing its datastore, the process consists in cloning the source virtual machine and deleting it, while effectively changing its Managed Object Reference (MoRef). Enabling High Availability for existing edge gateways in a data center with installed NSX Edge 6.4.0 fails. In a data center with installed NSX Edge 6.4.0, you cannot enable High Availability for existing edge gateways that belong to a datastore cluster with enabled Storage Distributed Resource Scheduler (SDRS). vCloud Director Tenant Portal does not display existing organization virtual data centers. When you use a self-signed SSL certificate for vCloud Director and you log in to vCloud Director Tenant Portal, you do not see a list of the existing organization virtual data centers. 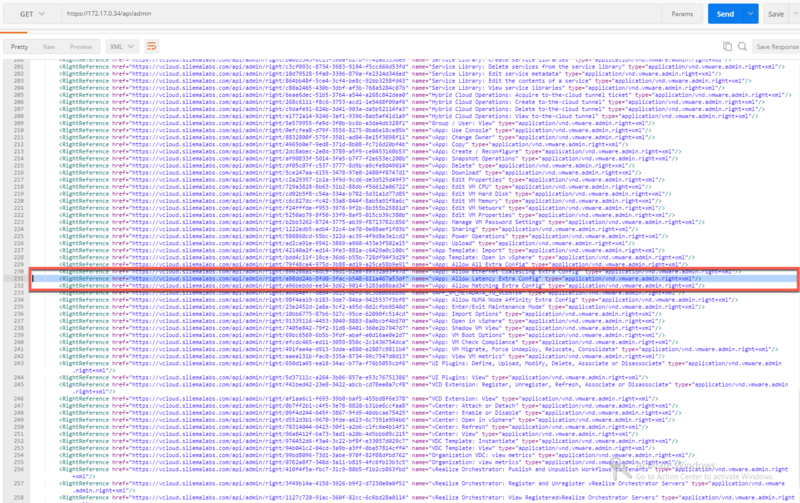 Just to finish up, there is still a lingering issue from the GA release that changed the behaviour of the HTML5 Tenant UI in scenarios where the SSL self signed certificates are used which is covered in this VMwareKB. Even though (as shown above) it’s been listed as resolved…I have run into it again in two different installs. Obviously, if you are using legit SSL certificates you won’t have the issue, however the work around is not doing it’s thing for me. Hopefully I can resolve this ASAP as I am about to start some validation testing for Veeam and vCloud Director as well as start to test out our new functionality coming in Update 4 of Backup & Replication for Cloud Connect Replication. For those with the correct entitlements…download here. Did you have any luck with the “No datacenters…” problem? I’m having it in one of our environments and the patch did nothing.